I come from an Italian family and we use olive oil for basically everything. I was flipping through a magazine yesterday (First for Women; They had the Dr. Oz endorsed hCG diet – Oh, gimmie a break, I was intrigued) and I came across a great use for olive oil: help treat cellulite. Here’s how: Combine 1 Tbs. of unflavored powdered gelatin, 1 Tbs. of water and 2 drops olive oil. Rub a pearl size amount of the mixture into your palms and apply to cellulite prone areas. “The collagen –packed gelatin helps skin appear more toned. Plus, the moisturizing olive oil plumps skin cells, so skin looks smoother and softer,” said Scott-Vincent Borba, author of The Personalized Solution for Healthier, Younger, and Flawless-Looking Skin. 1. Mix about one tsp. sugar with 1 tsp. olive oil to create a paste and smooth over lips. Using fingers or a soft tooth brush gently slough off dry skin leaving lips super smooth and ready for your favorite lipstick. 2. Mix about 2 Tbs. salt with 2 Tbs. olive oil and use as an all-over exfoliator (can be used with sugar too). It works great on elbows, knees, hands and feet. Rinse off the salt but leave the oil and let it soak in for extra smooth and hydrated legs. (If using on face follow scrub with a mild face wash.) Also, rub olive oil on hands and feet before bed. Wear cotton sock and gloves and awake to softer post-pedicure/manicure looking skin. 3. 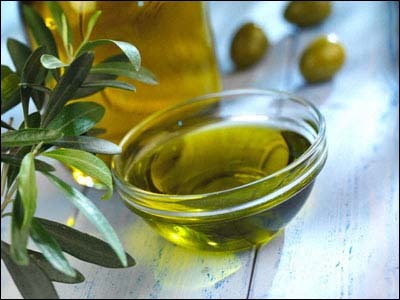 Strengthen brittle nails and rough cuticles by soaking them in a cup of olive oil. To help yellowing nails add lemon juice or scrub nail beds with baking soda before the olive oil soak. 5. Olive Oil Hair Mask: Take 1 to 2 egg yolks and beat them well. Add 2 Tbs. olive oil and beat mixture until blended. Apply to hair for 20 to 30 minutes and shampoo as usual. 6. Some swear by using olive oil in place of shaving cream. Smooth olive oil over legs, underarms even face and shave as usual. The oil creates a barrier for a close shave and hydrates the skin leaving it smoother and younger looking. 7. In a pinch you can use olive oil as a makeup remover. Rub a cotton ball dipped in olive oil over eyes and lips to help remove stubborn eye makeup or long wear lipstick. Make sure your wash your face afterward with face wash to avoid breakouts. Not in love with olive oil? Try substituting olive oil with coconut oil for nearly the same effect. I like coconut oil better for hair but nothing trumps the olive oil scrub.